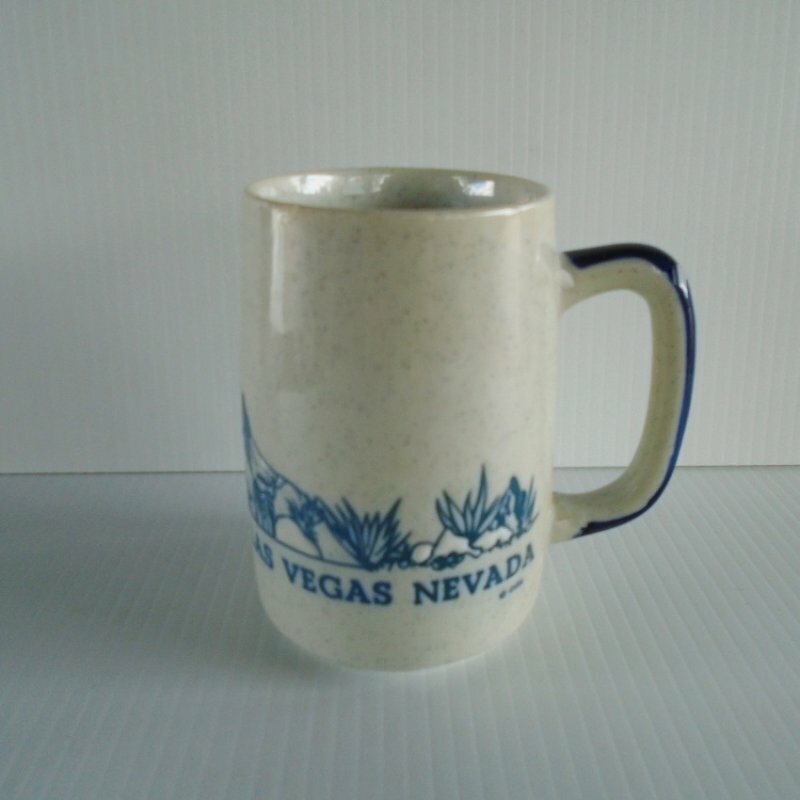 Las Vegas casinos stoneware mug. Features closed casinos Dunes, Sands, Hacienda, and several others. Pre 1993. Never used, displayed only. Estate purchase. 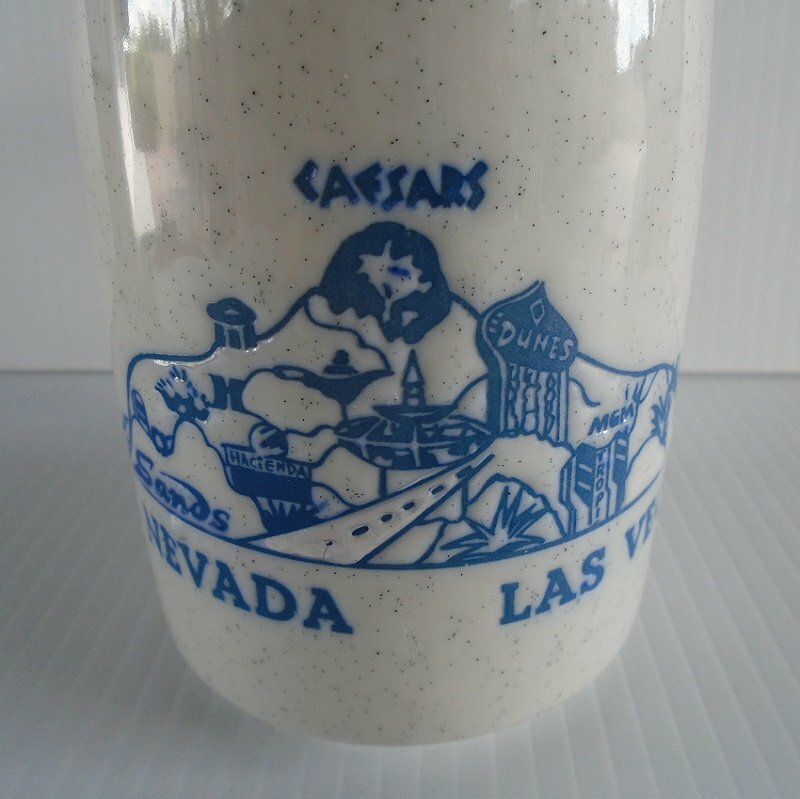 This stoneware mug says Las Vegas Nevada and features casinos (several closed for decades) and a desert scene. The casinos that I see are Sands, Caesars, Hacienda, Dunes, MGM, and others. I don't know the date of the mug, but the Sands and the Hacienda closed in 1996 and the Dunes closed in January 1993. So, it's over 27 years old. The mug stands almost 5 inches tall. It has a base color of off white with tiny blue speckles. It has a nice thick handle that provides a firm grip. The handle has a deep blue stripe running down the outer facing side. I obtained it at an estate sale. The seller's mother collected anything that had to do with Las Vegas casinos. Her collections were displayed in tall glass door cases. To her knowledge, the mug was never used to drink from. Buyer to pay $10.95 for USPS Priority Mail delivery charges. Every January the U.S. Postal Service increases the shipping prices. This year's increase is beyond any we've seen in previous years. Before the 2019 increase, shipping costs were based on weight. A package weighing less than one pound cost the same amount regardless if it was mailed 2 miles away, or from coast to coast. Packages weighing over 1 pound were priced by what the destination zipcode was. Now, the postal service has divided the United States in to 8 zones and all packages are charged by weight, size, and destination zone. Now it is not possible to state a shipping cost and have it be valid regardless if the package is traveling 2 miles or all the way to the east coast. I am in Arizona and probably 90% of the packages I mail out go eastward, and a majority of them go all the way to the east coast. To complicate this even further, Google will not show items for sale unless they have a designated cost, or unless the seller uses calculated shipping. My web host is not equipped to figure calculated shipping, so I have to quote a shipping charge using the east coast as the final destination and then refund over payments. When I return the overage, I usually do so by including cash inside the package when it's shipped. My feedback page will show verification that I do return overpayments.